It might be a bit grim to draw attention to this as we don't know how it will turn out. But if this were in the UK, the SAS would be on-site for sure, at least in an advisory capacity as a minimum, and probably with an Immediate Action plan. For anybody who doesn't know, an Immediate Action Plan is the plan you make for if they start shooting and you have to go in quick - the aim is to prevent a massacre. Then you sit back and prepare a Deliberate Action Plan which is what you will use if you decide to storm the place. His demands seem like they could easily be met. Oooooo just like the Ultimate Force Episode wannabees except it was a suicide bomber. Situation was resolved via a bullet to the head by a sniper. He has given him self up. According to kerrang radio. 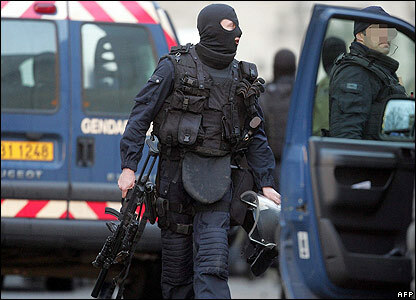 The french elite group GIGN were standing by with their FAMAS' and P90's :smile:. He will whit no doubt never get his old job back again after this, but instead get the chance to teach prisoners. Yer i feel kinda sorry for him. Hes obvioulsy lost his marbles and done something stupid. Atleast no1 was harmed. Don't mess with the French!! I think that is an MP5-A5 (with the retractable stock, although it looks like it might be SD which would make it the MP5 SD6) modded to hell and back with scope, torch (flashlight if you are US), probably a laser dot, and a front handgrip. He seems to have two handguns, one at his right hip, one at his left waist. The large pack at his left hip is probably his gas mask I would guess. Look at the thickness of the glass on his helmet, maybe it is bullet proof. He has an admirable number of pouches too. He certainly looks the part. I don't see a knife (but I guess with 3 guns...), and I don't see handcuffs. There are some other pictures but no more good ones, at THIS LINK. That's a P90, looks SD, with scope and flashlight I think. yeh those were 'apparantly' French Special forces. Who used there own negotiators to entice him to quit. No shots were fired. Luckily, because a room full of kids is a lot more difficult for an entry, than if the hostages were adults. Well, not to sell us short. But there are many many fine grade A Special Forces besides he British SAS; only I'm sure allot of them study with the SAS and tactics. SAS and some new "Flashbangs" made a hit when GSG9 raided a hijacks passenger jet they had to covertly follow all over the place. I think they also have some training relation to the Navy SEALs, and our Delta Boys make us pretty proud too. But the SAS Started it all in the modren realm. I think if negotiations failed a good sniper bullet to the throat would have done it since it was a lone guy. Eventually he would have passed a window as time went on. Obviously otherwise they would have had to storm the place if he was not in view. I doubt he would have shot one of the kids however you can never take that risk. Its more of a worry for the SF that one of thier guys would accidentally shoot the hostages. Adults tend to crap themselves and run around like drug crazed freaks in that kind of situation, so who knows how a bunch of kids will react, if 5 guys in black blew the windows out and started running around them shooting. Its not as simple as a 2 stage entry, kill the bad guy, everyones happy. Because he was was solo and in a pretty harmless/depressed state, it wouldve been so much safer and easier to just talk him out of it. Random, the SF never made entry, see above. LMAO LEON NOW T HAT IS FUNNY. Bet the SAS guys fromt he irainian embassy seige are glad that didn't happen on camera! Ya know I'd swear that pictures 2 and 3 where of the H&K International Training Division who also use Oakley googles and colored tape on their mag's. Yeah that's right Spidey. I just figured out. The info on the web-site where I found the pictures must have been wrong. 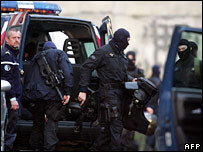 The pictures were linked to the french GIGN (Groupe d'Intervention Gendarmerie Nationale). Yes, although in my days as a tot GI Joe also had the option of a nifty Mag Clip to attach them together w/o the tape ^_^ Army should learn from the toy biz. What I dunt get is why does the HK ITD use colorized tap? I've seen pic's of red and yellow tape; maybe it's a reminder if some ones got blanks and some ones got live ammo?? Only time I've ever seen Colorized tap for it, was in Die Hard 2: Die Harder when it was red live mag, blue blanks for the SF / Tango's who where in cahoots. And thats only Hollywoods take.